Located in the heart of WaterColor on the south side of 30-A, this location offers close proximity to the vibrant Town Center and other popular amenities such as the Beach Club, WaterColor Workout, the Inn Spa, and retail shops. Guests staying in the Park District will enjoy close access to Cerulean Park and the many other gardens, ponds and paths located throughout. The Park District includes chic Town Center residences or charming coastal homes that sit between 30-A and Western Lake ranging from 2-5 blocks from the beach. WaterColor's notorious Camp District, home of Camp WaterColor, is nestled in the northeast section of the community, about 10 blocks from the beach. This area is the ideal location for families traveling with children. If you want to enjoy everything the community has to offer, the Cottage District just may be for you. Located about 6 blocks to the beach and centered around the communitys top-ranked Tennis Center, this lively area has a lot to offer active families. Located on the northern side of Western Lake, the Lake District offers nature lovers the opportunity to enjoy native landscaping and close proximity to a rare coastal dune lake. A beautifully crafted pedestrian bridge links guests in the Lake District to the Boat House and beyond. Enveloped by the dune woods, community greenways and scenic corridors lies the Crossing District. This gorgeous area boasts the exquisite Dragonfly pool and easy access to amenities and necessities such as the Publix grocery store. 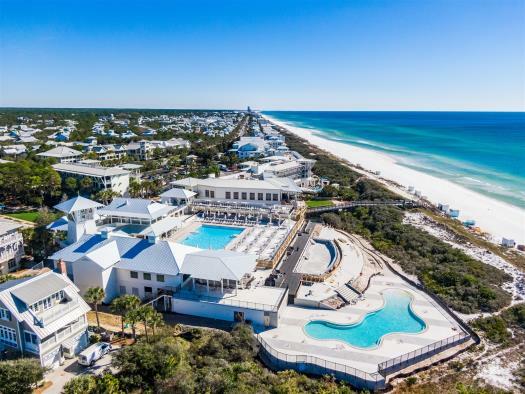 Just as the name would suggest, WaterColors Forest District is nestled in the coastal pine forests to create an unforgettable backdrop for your beach retreat. Conveniently located for easy access to Camp WaterColor or the shopping and dining of WaterColor Crossing, this area offers something for everyone.